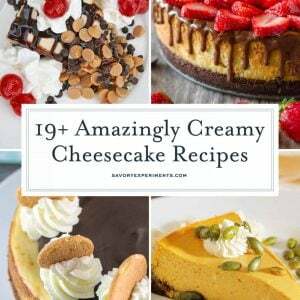 Looking for something new to make for breakfast or brunch? 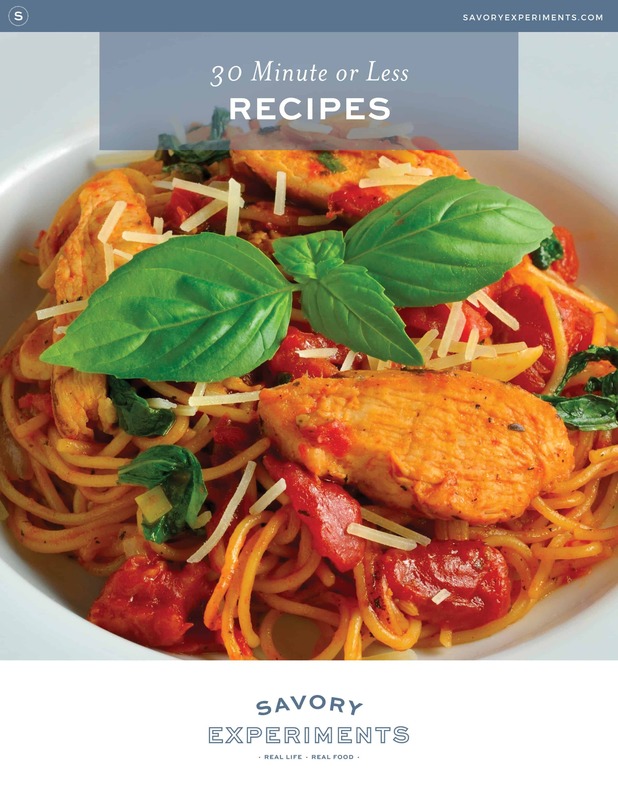 Or maybe you’re looking for some interesting sweet potato recipes. 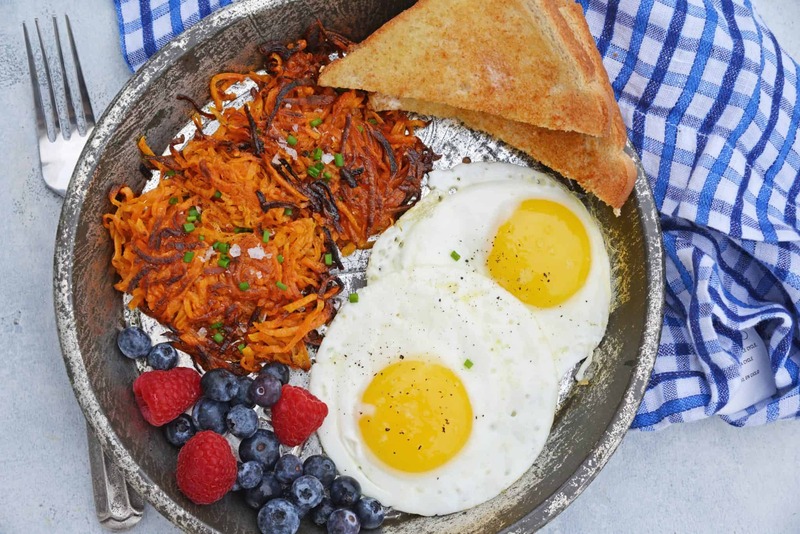 Either way, you’ll want to try these sweet potato hash browns! 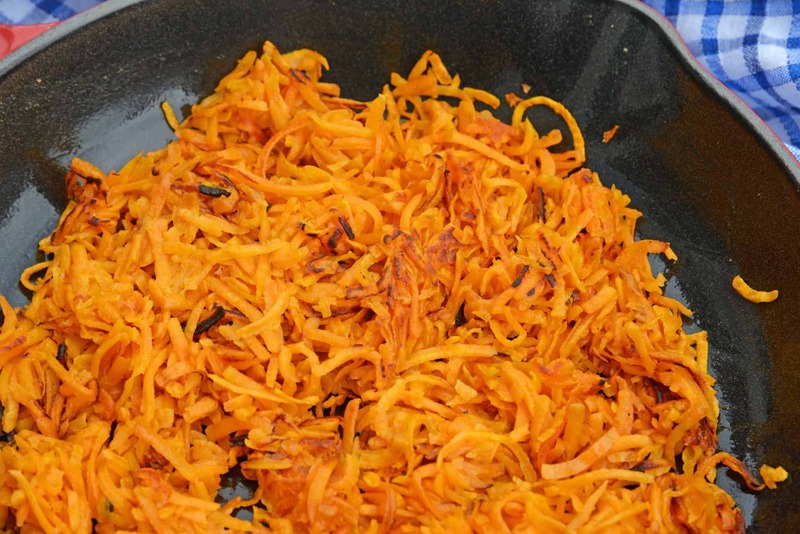 Sweet Potato Hash Browns require only 3 ingredients to prepare! You’ll never want to make brunch without them again. Though I don’t get to do it frequently due to busy mornings, I love making a big breakfast or brunch. Weekend brunch is one of my favorite ways to indulge and relax, especially when accompanied by a delicious mimosa. While I love all of the traditional brunch foods – pancakes, eggs, bacon, etc – sometimes I want to get a bit creative and try something new. 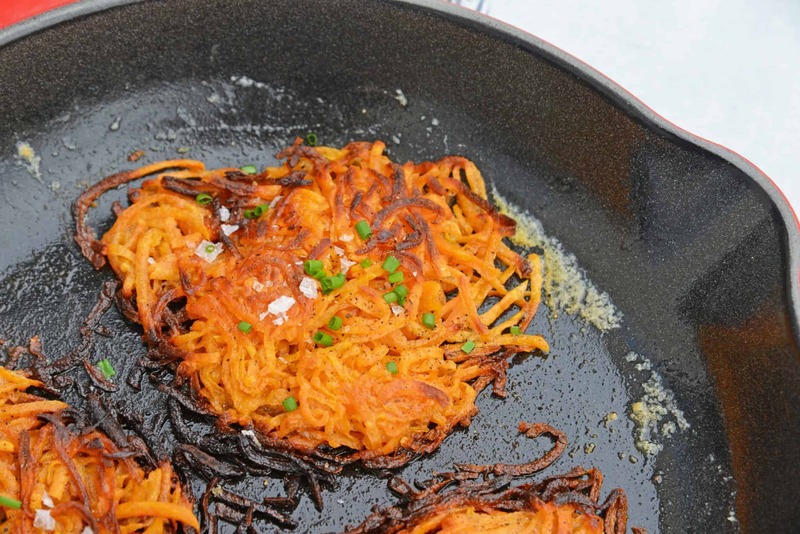 These Sweet Potato Hash Browns are my latest “something new”. 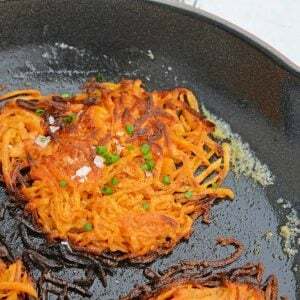 Traditional hash browns are great, if not a little boring, but these sweet potato hash browns, made with shredded sweet potatoes, takes it all to a new level. 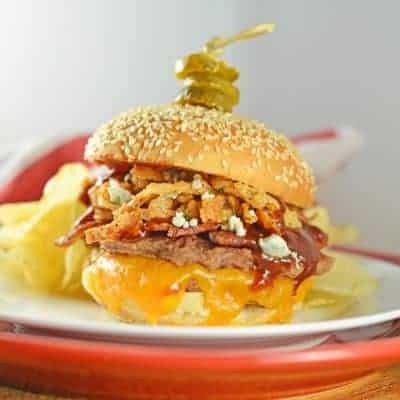 They’re sweet, soft on the inside but crunchy on the outside and as far from packaged hash brown patties as you can get. I love serving these with some eggs and bacon (and mimosa) for a delicious brunch. And, since sweet potatoes are better for you than regular potatoes, you can feel good about indulging! Sweet Potato Hash Browns are super easy to make. All you need is shredded sweet potatoes, salt, butter and some garnish. However, though the cook time is only a few minutes, the shredded sweet potatoes need to chill for at least one hour prior to cooking to release all of the water. Otherwise, you’ll end up with soggy, not-so-pretty or yummy hash browns. 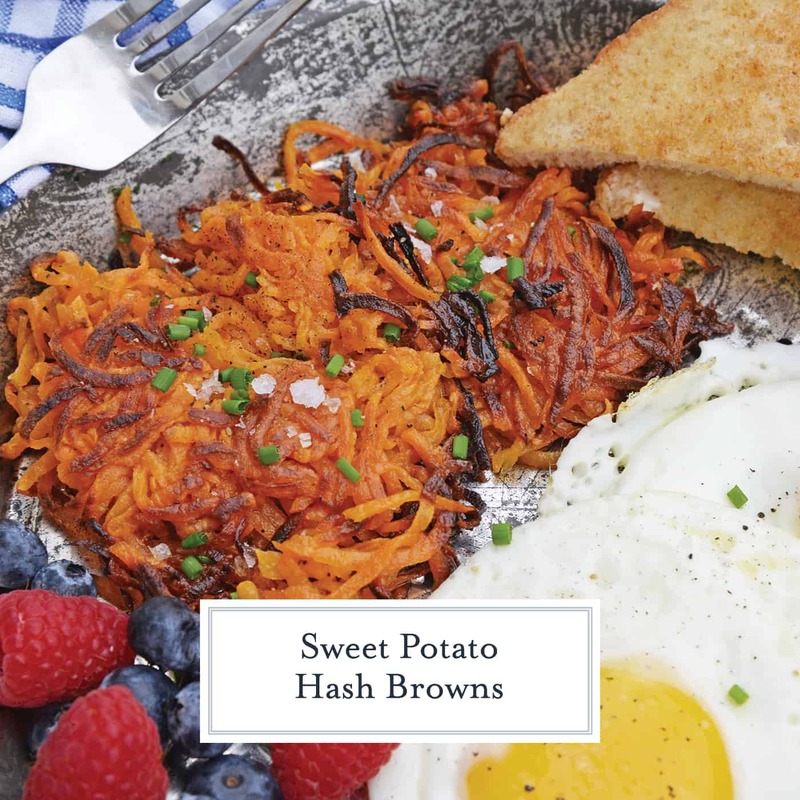 I recommended shredding the sweet potatoes at the beginning of breakfast or brunch prep, moving on to your next dishes, and then finishing up with the sweet potato hash browns. 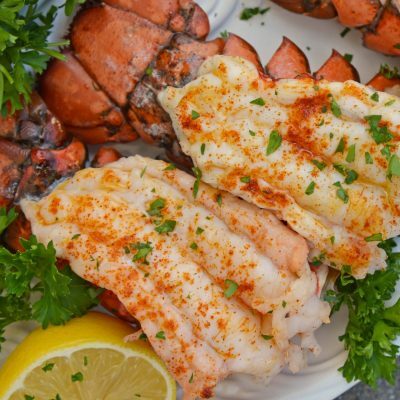 In my opinion, these are best served warm and fresh so this works out well any way. 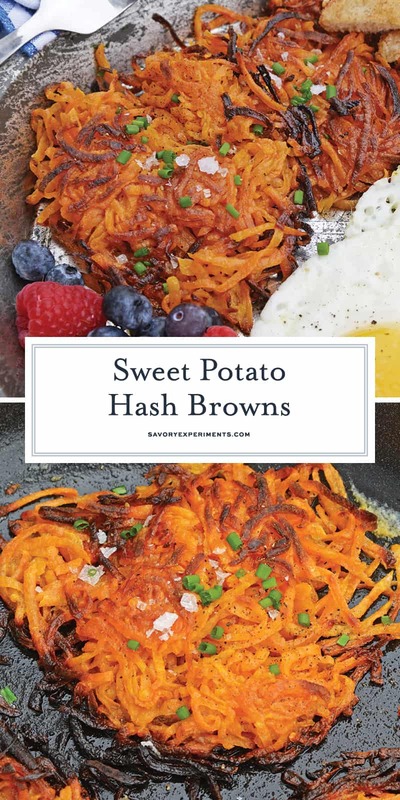 And, don’t feel limited to only making sweet potato hash browns for breakfast or brunch – you can definitely get creative and serve these as a side dish for lunch or dinner too! You don’t need a lot of potatoes. One is plenty to feed four people. 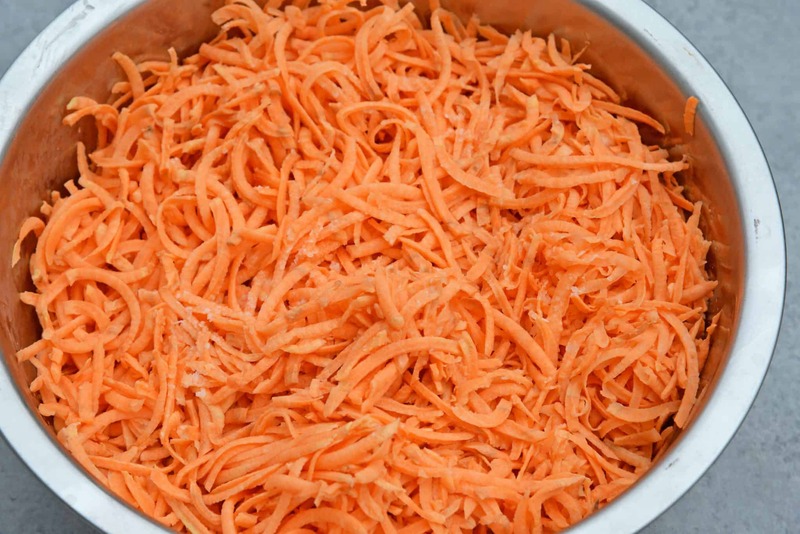 Use a box grater or food processor to get nice, even shreds. Salt your potatoes well and allow to sit in the fridge from an hour to release water. Wring potato shreds in a tea towel to further release excess water. Use butter when frying. It adds flavor instead of just ending up greasy. For pretty little potato stacks, mix with one well beaten egg to hold them together. Hash browns work best in cast iron or another heavy bottom pan. 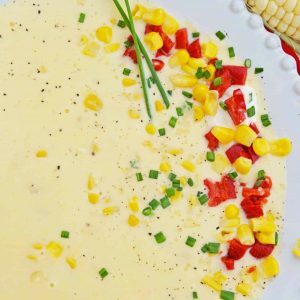 Here are some great breakfast recipes to serve alongside your crispy hash browns! 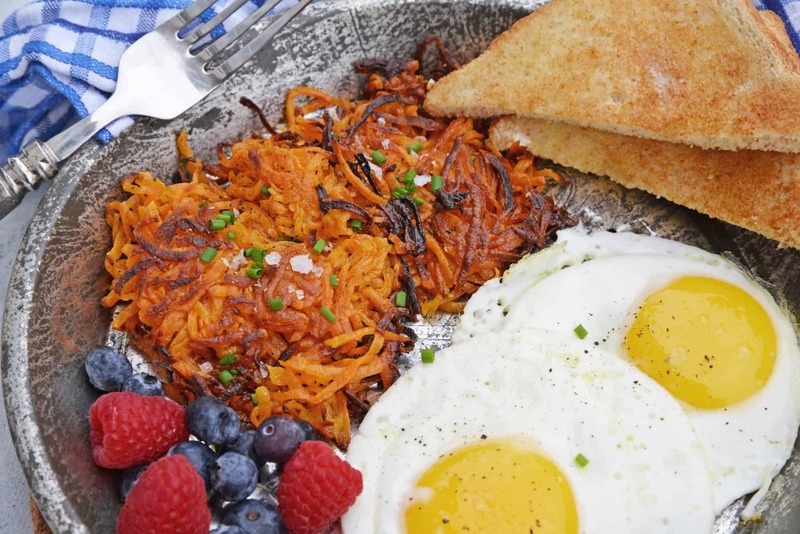 Sweet Potato Hash Browns are a simple breakfast recipe made with shredded sweet potatoes. 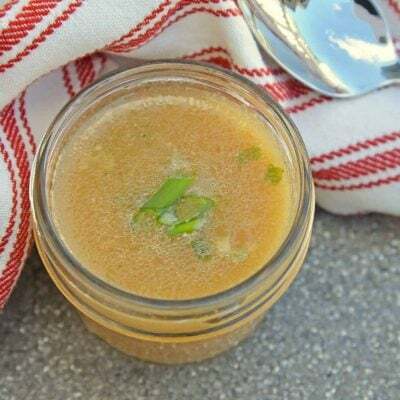 Only 3 ingredients and a few minutes to cook! Using a box grater or food processor, grate sweet potato. Toss with Kosher salt and chill, uncovered for 1 hour. Remove and working in batches, place sweet potato shreds in a tea towel and wring well, getting out as much liquid as possible. 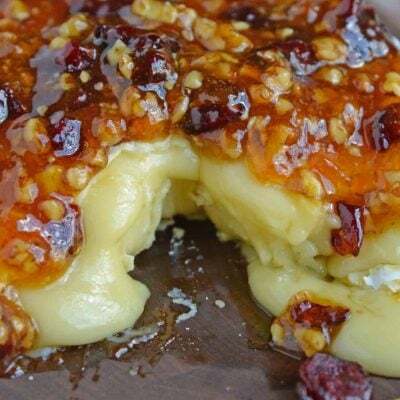 Heat 2 tablespoons butter in a cast iron skillet or other heavy bottom pan. Add half of your sweet potato shreds allowing them to brown before flipping and repeating on the other side, about 3 minutes on each side. Remove and repeat process with a new 2 tablespoons of butter and the remaining sweet potato shreds. Garnish with Maldon sea salt, ground pepper and chives. Taste before adding more salt, potatoes will still have salt from Kosher salt on them.